This week, we’re going to focus our discussion about handwriting for kids on spacing – making sure kids leave just the right amount of space between their letters and words. Have you ever seen kids’ writing where all of the letters and words are piled on top of each other with no spaces at all? Or maybe you’ve seen the opposite: huge gaps and spaces in the middle of words and sentences that don’t make any sense? 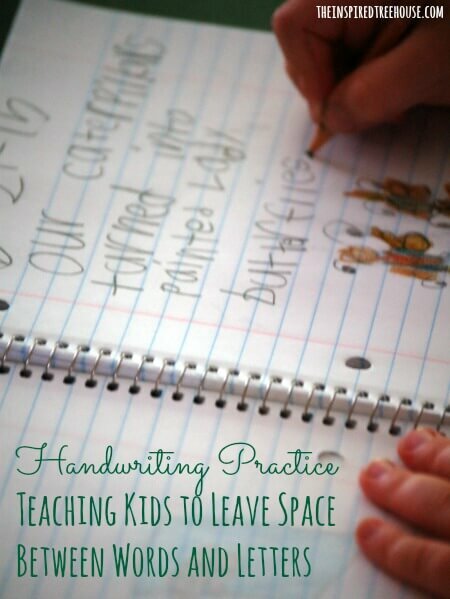 It’s one of the most common handwriting issues I see in my OT practice – spacing. Luckily, we have lots of little tricks we use in our school based practice to help support the development of this skill. Just as the key to letter formation and construction was lots of supervised practice, spacing takes a lot of practice with an adult present to make sure the tools and strategies are being used consistently and correctly. –Teach the child to place something down in between each word as he is writing. We often use popsicle sticks, pennies – or even the child’s finger, but you could also use other fun manipulatives for this to make it even more interesting. -I also love this Finger Spacer too and these astronaut spacing tools are adorable too! Or – you could always make your own Space Man spacing tool! –Reviewing a child’s handwriting with him can be very helpful so he can start to identify and correct his own spacing mistakes. I like to go back through a writing assignment with a child and draw smiley faces or place small stickers in each space to see how many “points” they can get (1 point for each smiley face). -Another strategy I love to use with kids is to read their writing out loud to them. If they’ve forgotten to leave spaces between words, I read it just as it’s written so it sounds jumbled and doesn’t make any sense. My own kiddo at home thinks this is hilarious and I’ve found that it’s a lighthearted way to bring the child’s attention to the fact that his writing won’t make sense without any spaces! 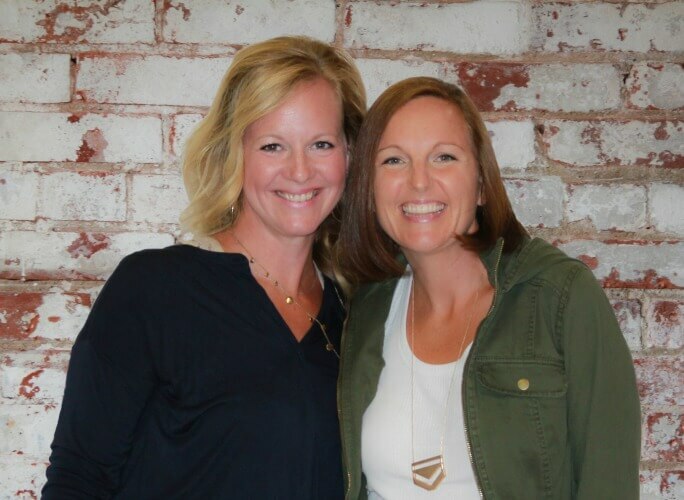 -I love the “Spaghetti and Meatball” handwriting trick from Miss Jamie OT over on the Handwriting With Katherine blog. Creative, hands-on, visually appealing, and fun! What are your best tricks for teaching kids how to leave adequate space between words and letters? This week in our handwriting project, kids will get to write about: their favorite things to do with their friends in the summertime! –Writing Prompt Handwriting Page for older kids who are ready to write on their own. –Fill in the Blank Page for little ones who need a little guidance and a shorter writing activity. One of the most common skills that kids tends to suffer over the summer? Handwriting. 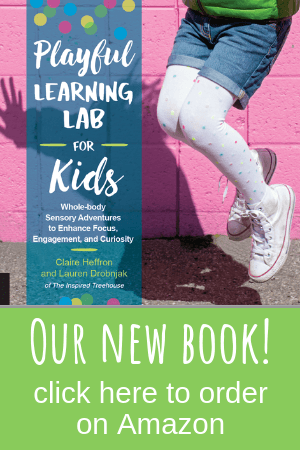 Kids can have difficulty with many aspects of this important skill, including letter formation, hand strength, maintaining spacing and sizing, and keeping their writing on the lines. In any case, practice makes perfect – and kids just don’t get a lot of practice with handwriting during the summer. 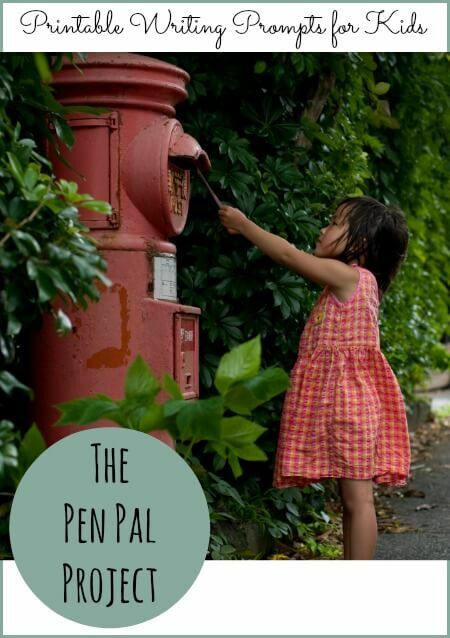 So this summer, we’re excited to bring you The Pen Pal Project! The goal of this project is to encourage kids to keep writing all summer long but to have fun while they’re doing it! Each week, we’ll provide printable writing prompts for kids that will be adapted for different ages (one with blank writing lines and one that’s fill-in-the-blank style). Encourage kids to complete the writing activity and then color in the pictures on the writing prompt to send to their friend! You’ll be able to find all of the writing prompts here as the summer goes on (we’ll post a new one each week). Definitely going to put these into practice! My daughter’s sentences read like one very looong word! lol! Hooray Emma! I know – the loooong, drawn out single word is a very common problem! 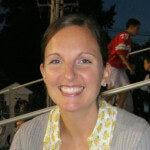 So glad to hear that you find these strategies useful! Let us know how it goes and which strategies were the most effective! We’d love to hear! I’m having trouble trying to get to the “Functional Skills for Kids handwriting and scissor skills products” that is 40% off right now. Links from my email, and the link at the top of this page – neither is working. Thank you for all of the wonderful information and fabulous ideas you provide! Your website is invaluable!